In number theory, Fermat's Last Theorem (sometimes called Fermat's conjecture, especially in older texts) states that no three positive integers a, b, and c satisfy the equation an + bn = cn for any integer value of n greater than two. The cases n = 1 and n = 2 have been known to have infinitely many solutions since antiquity. This theorem was first conjectured by Pierre de Fermat in 1637 in the margin of a copy of Arithmetica where he claimed he had a proof that was too large to fit in the margin. The first successful proof was released in 1994 by Andrew Wiles, and formally published in 1995, after 358 years of effort by mathematicians. The unsolved problem stimulated the development of algebraic number theory in the 19th century and the proof of the modularity theorem in the 20th century. It is among the most notable theorems in the history of mathematics and prior to its proof, it was in the Guinness Book of World Records as the "most difficult mathematical problem", one of the reasons being that it has the largest number of unsuccessful proofs. With the special case n = 4 proved, it suffices to prove the theorem for exponents n that are prime numbers (this reduction is considered trivial to prove[note 1]). Over the next two centuries (1637–1839), the conjecture was proved for only the primes 3, 5, and 7, although Sophie Germain innovated and proved an approach that was relevant to an entire class of primes. In the mid-19th century, Ernst Kummer extended this and proved the theorem for all regular primes, leaving irregular primes to be analyzed individually. Building on Kummer's work and using sophisticated computer studies, other mathematicians were able to extend the proof to cover all prime exponents up to four million, but a proof for all exponents was inaccessible (meaning that mathematicians generally considered a proof impossible, exceedingly difficult, or unachievable with current knowledge). The proof of Fermat's Last Theorem in full, for all n, was finally accomplished 357 years later by Andrew Wiles in 1994, an achievement for which he was honoured and received numerous awards, including the 2016 Abel Prize. The solution came in a roundabout manner, from a completely different area of mathematics. Around 1955, Japanese mathematicians Goro Shimura and Yutaka Taniyama suspected a link might exist between elliptic curves and modular forms, two completely different areas of mathematics. Known at the time as the Taniyama–Shimura-Weil conjecture, and (eventually) as the modularity theorem, it stood on its own, with no apparent connection to Fermat's Last Theorem. It was widely seen as significant and important in its own right, but was (like Fermat's theorem) widely considered completely inaccessible to proof. In 1984, Gerhard Frey noticed an apparent link between the modularity theorem and Fermat's Last Theorem. This potential link was confirmed two years later by Ken Ribet, who gave a conditional proof of Fermat's Last Theorem that depended on the modularity theorem (see: Ribet's Theorem and Frey curve). On hearing this, English mathematician Andrew Wiles, who had a childhood fascination with Fermat's Last Theorem, decided to try to prove the modularity theorem as a way to prove Fermat's Last Theorem. In 1993, after six years working secretly on the problem, Wiles succeeded in proving enough of the modularity theorem to prove Fermat's Last Theorem for odd prime exponents. Wiles's paper was massive in size and scope. A flaw was discovered in one part of his original paper during peer review and required a further year and collaboration with a past student, Richard Taylor, to resolve. As a result, the final proof in 1995 was accompanied by a second, smaller, joint paper to that effect. Wiles's achievement was reported widely in the popular press, and was popularized in books and television programs. The remaining parts of the modularity theorem were subsequently proved by other mathematicians, building on Wiles's work, between 1996 and 2001. There are several simple alternative ways to state Fermat's Last Theorem that are equivalent to the one given above. In order to state them, let N be the set of natural numbers 1,2,3,..., let Z be the set of integers 0, ±1, ±2,..., and let Q be the set of rational numbers a/b where a and b are in Z with b≠0. In what follows we will call a solution to xn + yn = zn where one or more of x, y, or z is zero a trivial solution. A solution where all three are non-zero will be called a non-trivial solution. For comparison's sake we start with the original formulation. Original statement. With n, x, y, z ∈ N and n > 2 the equation xn + yn = zn has no solutions. Equivalent statement 1: xn + yn = zn, where n ≥ 3, has no non-trivial solutions x, y, z ∈ Z. The equivalence is clear if n is even. If n is odd and all three of x, y, z are negative then we can replace x, y, z with −x, −y, −z to obtain a solution in N. If two of them are negative, it must be x and z or y and z. If x, z are negative and y is positive, then we can rearrange to get (−z)n + yn = (−x)n resulting in a solution in N; the other case is dealt with analogously. Now if just one is negative, it must be x or y. If x is negative, and y and z are positive, then it can be rearranged to get (−x)n + zn = yn again resulting in a solution in N; if y is negative, the result follows symmetrically. Thus in all cases a nontrivial solution in Z results in a solution in N.
Equivalent statement 2: xn + yn = zn, where n ≥ 3, has no non-trivial solutions x, y, z ∈ Q. Equivalent statement 3: xn + yn = 1, where n ≥ 3, has no non-trivial solutions x, y ∈ Q. Connection to elliptic curves: If a, b, c is a non-trivial solution to xp + yp = zp , p odd prime, then y2 = x(x − ap)(x + bp) (Frey curve) is an elliptic curve. Examining this elliptic curve with Ribet's theorem shows that it cannot have a modular form. The proof by Andrew Wiles shows that y2 = x(x − an)(x + bn) always has a modular form. This implies that a non-trivial solution to xp + yp = zp, p odd prime, would create a contradiction. This shows that no non-trivial solutions exist. Examples of Pythagorean triples include (3, 4, 5) and (5, 12, 13). There are infinitely many such triples, and methods for generating such triples have been studied in many cultures, beginning with the Babylonians and later ancient Greek, Chinese, and Indian mathematicians. The traditional interest in Pythagorean triples connects with the Pythagorean theorem; in its converse form, it states that a triangle with sides of lengths a, b, and c has a right angle between the a and b legs when the numbers are a Pythagorean triple. Fermat's Last Theorem is an extension of this problem to higher powers, stating that no solution exists when the exponent 2 is replaced by any larger integer. After Fermat’s death in 1665, his son Clément-Samuel Fermat produced a new edition of the book (1670) augmented with his father’s comments. The margin note became known as Fermat’s Last Theorem, as it was the last of Fermat’s asserted theorems to remain unproved. Taylor and Wiles’s proof relies on 20th-century techniques. Fermat’s proof would have had to be elementary by comparison, given the mathematical knowledge of his time. While Harvey Friedman’s grand conjecture implies that any provable theorem (including Fermat’s last theorem) can be proved using only ‘elementary function arithmetic’, such a proof need be ‘elementary’ only in a technical sense and could involve millions of steps, and thus be far too long to have been Fermat’s proof. has no primitive solutions in integers (no pairwise coprime solutions). In turn, this proves Fermat's Last Theorem for the case n = 4, since the equation a4 + b4 = c4 can be written as c4 − b4 = (a2)2. For another proof for n=4 by infinite descent, see Infinite descent: Non-solvability of r2 + s4 = t4. For various proofs for n=4 by infinite descent, see Grant and Perella (1999), Barbara (2007), and Dolan (2011). Thus, to prove that Fermat's equation has no solutions for n > 2, it would suffice to prove that it has no solutions for at least one prime factor of every n. Each integer n > 2 is divisible by 4 or an odd prime number (or both). Therefore, Fermat's Last Theorem could be proved for all n if it could be proved for n = 4 and for all odd primes p.
In the early 19th century, Sophie Germain developed several novel approaches to prove Fermat's Last Theorem for all exponents. First, she defined a set of auxiliary primes θ constructed from the prime exponent p by the equation θ = 2hp + 1, where h is any integer not divisible by three. She showed that, if no integers raised to the pth power were adjacent modulo θ (the non-consecutivity condition), then θ must divide the product xyz. Her goal was to use mathematical induction to prove that, for any given p, infinitely many auxiliary primes θ satisfied the non-consecutivity condition and thus divided xyz; since the product xyz can have at most a finite number of prime factors, such a proof would have established Fermat's Last Theorem. Although she developed many techniques for establishing the non-consecutivity condition, she did not succeed in her strategic goal. She also worked to set lower limits on the size of solutions to Fermat's equation for a given exponent p, a modified version of which was published by Adrien-Marie Legendre. As a byproduct of this latter work, she proved Sophie Germain's theorem, which verified the first case of Fermat's Last Theorem (namely, the case in which p does not divide xyz) for every odd prime exponent less than 100. Germain tried unsuccessfully to prove the first case of Fermat's Last Theorem for all even exponents, specifically for n = 2p, which was proved by Guy Terjanian in 1977. In 1985, Leonard Adleman, Roger Heath-Brown and Étienne Fouvry proved that the first case of Fermat's Last Theorem holds for infinitely many odd primes p.
Kummer set himself the task of determining whether the cyclotomic field could be generalized to include new prime numbers such that unique factorisation was restored. He succeeded in that task by developing the ideal numbers. Using the general approach outlined by Lamé, Kummer proved both cases of Fermat's Last Theorem for all regular prime numbers. However, he could not prove the theorem for the exceptional primes (irregular primes) that conjecturally occur approximately 39% of the time; the only irregular primes below 100 are 37, 59 and 67. In the 1920s, Louis Mordell posed a conjecture that implied that Fermat's equation has at most a finite number of nontrivial primitive integer solutions, if the exponent n is greater than two. This conjecture was proved in 1983 by Gerd Faltings, and is now known as Faltings' theorem. The strategy that ultimately led to a successful proof of Fermat's Last Theorem arose from the "astounding":211 Taniyama–Shimura-Weil conjecture, proposed around 1955—which many mathematicians believed would be near to impossible to prove,:223 and was linked in the 1980s by Gerhard Frey, Jean-Pierre Serre and Ken Ribet to Fermat's equation. By accomplishing a partial proof of this conjecture in 1994, Andrew Wiles ultimately succeeded in proving Fermat's Last Theorem, as well as leading the way to a full proof by others of what is now the modularity theorem. would have such unusual properties that it was unlikely to be modular. This would conflict with the modularity theorem, which asserted that all elliptic curves are modular. As such, Frey observed that a proof of the Taniyama–Shimura-Weil conjecture would simultaneously prove Fermat's Last Theorem and equally, a disproof or refutation of Fermat's Last Theorem would disprove the conjecture. Following this strategy, a proof of Fermat's Last Theorem required two steps. First, it was necessary to prove the modularity theorem – or at least to prove it for the sub-class of cases (known as semistable elliptic curves) that included Frey's equation – and this was widely believed inaccessible to proof by contemporary mathematicians. :203–205, 223, 226 Second, it was necessary to show that Frey's intuition was correct: that if an elliptic curve were constructed in this way, using a set of numbers that were a solution of Fermat's equation, the resulting elliptic curve could not be modular. Frey did not quite succeed in proving this rigorously; the missing piece (the so-called "epsilon conjecture", now known as Ribet's theorem) was identified by Jean-Pierre Serre and proved in 1986 by Ken Ribet. The modularity theorem – if proved – would mean all elliptic curves (or at least all semistable elliptic curves) are of necessity modular. The contradiction would imply (if the modularity theorem were correct) that no solutions can exist to Fermat's equation – therefore proving Fermat's Last Theorem. The error would not have rendered his work worthless – each part of Wiles's work was highly significant and innovative by itself, as were the many developments and techniques he had created in the course of his work, and only one part was affected. :289, 296–297 However without this part proved, there was no actual proof of Fermat's Last Theorem. Wiles spent almost a year trying to repair his proof, initially by himself and then in collaboration with Richard Taylor, without success. On 19 September 1994, on the verge of giving up, Wiles had a flash of insight that the proof could be saved by returning to his original Horizontal Iwasawa theory approach, which he had abandoned in favour of the Kolyvagin–Flach approach, this time strengthening it with expertise gained in Kolyvagin–Flach's approach. On 24 October 1994, Wiles submitted two manuscripts, "Modular elliptic curves and Fermat's Last Theorem" and "Ring theoretic properties of certain Hecke algebras", the second of which was co-authored with Taylor and proved that certain conditions were met that were needed to justify the corrected step in the main paper. The two papers were vetted and published as the entirety of the May 1995 issue of the Annals of Mathematics. These papers established the modularity theorem for semistable elliptic curves, the last step in proving Fermat's Last Theorem, 358 years after it was conjectured. for positive, coprime integers m, n.
In 1908, the German industrialist and amateur mathematician Paul Wolfskehl bequeathed 100,000 gold marks—a large sum at the time—to the Göttingen Academy of Sciences to offer as a prize for a complete proof of Fermat's Last Theorem. On 27 June 1908, the Academy published nine rules for awarding the prize. Among other things, these rules required that the proof be published in a peer-reviewed journal; the prize would not be awarded until two years after the publication; and that no prize would be given after 13 September 2007, roughly a century after the competition was begun. Wiles collected the Wolfskehl prize money, then worth $50,000, on 27 June 1997. In March 2016, Wiles was awarded the Norwegian government's Abel prize worth €600,000 for "for his stunning proof of Fermat’s Last Theorem by way of the modularity conjecture for semistable elliptic curves, opening a new era in number theory." ↑ Wiles, Andrew (1995). "Modular elliptic curves and Fermat's Last Theorem" (PDF). Annals of Mathematics. 141 (3): 448. doi:10.2307/2118559. JSTOR 2118559. OCLC 37032255. Frey's suggestion, in the notation of the following theorem, was to show that the (hypothetical) elliptic curve y2 = x(x + up)(x - vp) could not be modular. ↑ Ribet, Ken (1990). "On modular representations of Gal(Q/Q) arising from modular forms" (PDF). Inventiones mathematicae. 100 (2): 432. doi:10.1007/BF01231195. MR 1047143. ↑ Friberg, pp. 333– 334. ↑ Euler L (1738). "Theorematum quorundam arithmeticorum demonstrationes". Comm. Acad. Sci. Petrop. 10: 125–146. . Reprinted Opera omnia, ser. I, "Commentationes Arithmeticae", vol. I, pp. 38–58, Leipzig:Teubner (1915). 1 2 3 Kausler CF (1802). "Nova demonstratio theorematis nec summam, nec differentiam duorum cuborum cubum esse posse". Novi Acta Acad. Petrop. 13: 245–253. ↑ Terquem O (1846). "Théorèmes sur les puissances des nombres". Nouv. Ann. Math. 5: 70–87. ↑ Lebesgue VA (1853). "Résolution des équations biquadratiques z2 = x4 ± 2my4, z2 = 2mx4 − y4, 2mz2 = x4 ± y4". J. Math. Pures Appl. 18: 73–86. ↑ Pepin T (1883). "Étude sur l'équation indéterminée ax4 + by4 = cz2". Atti Accad. Naz. Lincei. 36: 34–70. ↑ Tafelmacher WLA (1893). "Sobre la ecuación x4 + y4 = z4". Ann. Univ. Chile. 84: 307–320. ↑ Bendz TR (1901). Öfver diophantiska ekvationen xn + yn = zn. Uppsala: Almqvist & Wiksells Boktrycken. 1 2 3 Gambioli D (1901). 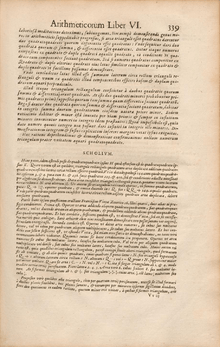 "Memoria bibliographica sull'ultimo teorema di Fermat". Period. Mat. 16: 145–192. ↑ Bang A (1905). "Nyt Bevis for at Ligningen x4 − y4 = z4, ikke kan have rationale Løsinger". Nyt Tidsskrift Mat. 16B: 35–36. ↑ Bottari A (1908). "Soluzione intere dell'equazione pitagorica e applicazione alla dimostrazione di alcune teoremi della teoria dei numeri". Period. Mat. 23: 104–110. 1 2 Rychlik K (1910). "On Fermat's last theorem for n = 4 and n = 3 (in Bohemian)". Časopis Pěst. Mat. 39: 65–86. ↑ Nutzhorn F (1912). "Den ubestemte Ligning x4 + y4 = z4". Nyt Tidsskrift Mat. 23B: 33–38. ↑ Carmichael RD (1913). "On the impossibility of certain Diophantine equations and systems of equations". Amer. Math. Monthly. Mathematical Association of America. 20 (7): 213–221. doi:10.2307/2974106. JSTOR 2974106. ↑ Vrǎnceanu G (1966). "Asupra teorema lui Fermat pentru n=4". Gaz. Mat. Ser. A. 71: 334–335. Reprinted in 1977 in Opera matematica, vol. 4, pp. 202–205, Bucureşti:Edit. Acad. Rep. Soc. Romana. ↑ Grant, Mike, and Perella, Malcolm, "Descending to the irrational", Mathematical Gazette 83, July 1999, pp.263–267. ↑ Legendre AM (1823). "Recherches sur quelques objets d'analyse indéterminée, et particulièrement sur le théorème de Fermat". Mém. Acad. Roy. Sci. Institut France. 6: 1–60. Reprinted in 1825 as the "Second Supplément" for a printing of the 2nd edition of Essai sur la Théorie des Nombres, Courcier (Paris). Also reprinted in 1909 in Sphinx-Oedipe, 4, 97–128. ↑ Lamé G (1865). "Étude des binômes cubiques x3 ± y3". C. R. Acad. Sci. Paris. 61: 921–924, 961–965. ↑ Tait PG (1872). "Mathematical Notes". Proc. Roy. Soc. Edinburgh. 7: 144. 1 2 van der Corput JG (1915). "Quelques formes quadratiques et quelques équations indéterminées". Nieuw Archief Wisk. 11: 45–75. ↑ Duarte FJ (1944). "Sobre la ecuación x3 + y3 + z3 = 0". Ciencias Fis. Mat. Naturales (Caracas). 8: 971–979. ↑ Lebesgue VA (1843). "Théorèmes nouveaux sur l'équation indéterminée x5 + y5 = az5". J. Math. Pures Appl. 8: 49–70. ↑ Lamé G (1847). "Mémoire sur la résolution en nombres complexes de l'équation A5 + B5 + C5 = 0". J. Math. Pures Appl. 12: 137–171. ↑ Lamé G (1839). 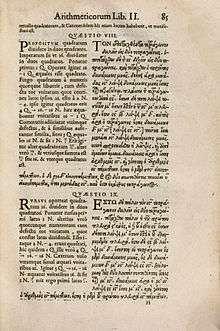 "Mémoire sur le dernier théorème de Fermat". C. R. Acad. Sci. Paris. 9: 45–46. Lamé G (1840). "Mémoire d'analyse indéterminée démontrant que l'équation x7 + y7 = z7 est impossible en nombres entiers". J. Math. Pures Appl. 5: 195–211. ↑ Lebesgue VA (1840). "Démonstration de l'impossibilité de résoudre l'équation x7 + y7 + z7 = 0 en nombres entiers". J. Math. Pures Appl. 5: 276–279, 348–349. ↑ Genocchi A (1864). "Intorno all'equazioni x7 + y7 + z7 = 0". Annali Mat. 6: 287–288. Genocchi A (1874). "Sur l'impossibilité de quelques égalités doubles". C. R. Acad. Sci. Paris. 78: 433–436. Genocchi A (1876). "Généralisation du théorème de Lamé sur l'impossibilité de l'équation x7 + y7 + z7 = 0". C. R. Acad. Sci. Paris. 82: 910–913. ↑ Pepin T (1876). "Impossibilité de l'équation x7 + y7 + z7 = 0". C. R. Acad. Sci. Paris. 82: 676–679, 743–747. ↑ Maillet E (1897). "Sur l'équation indéterminée axλt + byλt = czλt". Assoc. Française Avanc. Sci., St. Etienne (sér. II). 26: 156–168. ↑ Thue A (1896). "Über die Auflösbarkeit einiger unbestimmter Gleichungen". Det Kongel. Norske Videnskabers Selskabs Skrifter. 7. Reprinted in Selected Mathematical Papers, pp. 19–30, Oslo:Universitetsforlaget (1977). ↑ Tafelmacher WLA (1897). "La ecuación x3 + y3 = z2: Una demonstración nueva del teorema de fermat para el caso de las sestas potencias". Ann. Univ. Chile, Santiago. 97: 63–80. ↑ Lind B (1909). "Einige zahlentheoretische Sätze". Arch. Math. Phys. 15: 368–369. 1 2 Kapferer H (1913). "Beweis des Fermatschen Satzes für die Exponenten 6 und 10". Arch. Math. Phys. 21: 143–146. ↑ Swift E (1914). "Solution to Problem 206". Amer. Math. Monthly. 21: 238–239. 1 2 Breusch R (1960). "A simple proof of Fermat's last theorem for n = 6, n = 10". Math. Mag. 33 (5): 279–281. doi:10.2307/3029800. JSTOR 3029800. ↑ Dirichlet PGL (1832). "Démonstration du théorème de Fermat pour le cas des 14e puissances". J. Reine Angew. Math. 9: 390–393. Reprinted in Werke, vol. I, pp. 189–194, Berlin:G. Reimer (1889); reprinted New York:Chelsea (1969). ↑ Terjanian G (1974). "L'équation x14 + y14 = z14 en nombres entiers". Bull. Sci. Math. (sér. 2). 98: 91–95. ↑ Terjanian, G. (1977). "Sur l'équation x2p + y2p = z2p". Comptes rendus hebdomadaires des séances de l'Académie des sciences. Série a et B. 285: 973–975. ↑ Adleman LM, Heath-Brown DR (June 1985). "The first case of Fermat's last theorem". Inventiones Mathematicae. Berlin: Springer. 79 (2): 409–416. doi:10.1007/BF01388981. ↑ Faltings G (1983). "Endlichkeitssätze für abelsche Varietäten über Zahlkörpern". Inventiones Mathematicae. 73 (3): 349–366. doi:10.1007/BF01388432. ↑ Buhler J, Crandell R, Ernvall R, Metsänkylä T (1993). "Irregular primes and cyclotomic invariants to four million". Math. Comp. American Mathematical Society. 61 (203): 151–153. doi:10.2307/2152942. JSTOR 2152942. ↑ Frey G (1986). "Links between stable elliptic curves and certain diophantine equations". Ann. Univ. Sarav. Ser. Math. 1: 1–40. ↑ Ribet, Ken (1990). "On modular representations of Gal(Q/Q) arising from modular forms" (PDF). Inventiones mathematicae. 100 (2): 431–476. doi:10.1007/BF01231195. MR 1047143. ↑ Singh, pp. 275–277; Aczel, pp. 132–134. ↑ Lenstra, Jr. H.W. (1992). On the inverse Fermat equation, Discrete Mathematics, 106–107, pp. 329–331. ↑ Newton, M., "A radical diophantine equation", Journal of Number Theory 13 (1981), 495–498. Kleiner I (2000). "From Fermat to Wiles: Fermat's Last Theorem Becomes a Theorem" (PDF). Elem. Math. 55: 19–37. doi:10.1007/PL00000079. Faltings G (July 1995). "The Proof of Fermat's Last Theorem by R. Taylor and A. Wiles" (PDF). Notices of the AMS. 42 (7): 743–746. ISSN 0002-9920. Elkies, Noam D. "Tables of Fermat "near-misses" — approximate solutions of xn + yn = zn". Shay, David (2003). "Fermat's Last Theorem". Retrieved 5 August 2004. The story, the history and the mystery. O'Connor JJ, Robertson EF (1996). "Fermat's last theorem". Retrieved 5 August 2004.